A riot outside the NZ parliament in June 1968? An account of a little-known strike and unruly demonstration outside parliament, Wellington, New Zealand, June 1968. Given these assertions, it is puzzling that this protest has received little attention. 7 I’ll attempt to shed some light on this event, and discuss whether or not it was violent. I’ll also look at whether the one-day stoppage on the day of this ‘riot’ can be called a Wellington general strike. What was the June 26 1968 protest all about? •	The major protest of the day was against the Arbitration Court’s nil wage order which had been announced on 17 June 1968. Given inflation, this order was effectively an across-the-board wage-cut. The Wellington Trades Council organised a one-day strike on June 26 and a march from Trades Hall to Parliament grounds. There was also a watersiders’ march to Parliament to protest the order. •	Seamen protested against the lack of safety at sea. •	Members of the Wellington Committee on Vietnam decided to show their opposition to the Vietnam War and SEATO (South East Asia Treaty Organisation). This was just after the popular Peace, Power and Politics counter-conference to SEATO in April 1968. The Campaign for Nuclear Disarmament was also protesting against French nuclear testing. •	The Wellington branch of the Campaign Against Rising Prices was there, claiming that rising prices affected working class people the hardest. There was a mini recession in 1967-68, and some resulting unemployment. Was the protest a riot? The left-wing and student press hotly and unanimously denied that the protest was a riot, or even violent. Several, such as the New Zealand Monthly Review, argued that the only ‘violence’ that occurred was in small scuffles between police and demonstrators. 23 Terry Adams, then the Assistant Secretary of the Wellington Seamen’s Union, wryly wrote, ‘if this was violence, then I must admit I’ve seen worse on a wharfies’ picnic day.’ 24 Only two arrests were made, a far cry from the more turbulent demonstrations of the era, such as the Agnew protest in Auckland in 1970, the ‘battle of Willis Street’ in Wellington in 1970 and the Mt. John protest in 1972. The protest did involve surges against police lines, pushing and shoving, attempts to place the Viet Cong flag on the steps, and tussles with police, and thus may be called direct confrontation, but not real violence. Was this a Wellington general strike? I ask this because Chris Trotter has optimistically asserted that a similar union stoppage in 1970 in Wellington was ‘effectively a half-day general strike by the capital’s wage workers.’ 25 General strikes can be city-based rather than nationwide, such as the Seattle General Strike of 1919. So can the 1968 strike be called a Wellington-wide general strike? I doubt this for several reasons. Firstly, Toby Hill did not call for a strike at all firms in Wellington. He only called for a strike at firms which had not already granted an increase in wages in defiance of the nil wage order. Secondly, some unions, such as the Wellington Builders’ and General Labourers’ Union, disassociated themselves from the Trades Council’s call for a stoppage. 26 Thirdly, although I have not found enough evidence about the support for the strike on June 26, if one relies upon the Dominion, the strike did not appear to be universal or general at all. From this patchy evidence, the strike can be viewed as more of a small mass strike (I use the terminology of Rosa Luxemburg in her 1906 article) than a general one, especially as it seems that only about 3000 or more workers attended the demonstration on the day. I think it’s easy to over romanticise large strikes, and see them as more general and radical than they were. This protest and strike was significant for many reasons. It highlighted the remarkable convergence of issues at the time, and how protest on one issue fuelled protest on another. It was part of a wider strike movement that was an essential factor in stopping the nil wage order, and gaining workers a 5% pay increase. As the most important example of worker-student solidarity during the 1960s and 1970s, it gave hope to some that an alliance between workers and radical youth could be formed. It was possibly the first significant protest over the alienation of Maori land during the 1960s. It highlighted how workers and protesters gained confidence that through their collective action, they could more effectively oppose the establishment – and there was a significant rise in strike action, direct action and protest activity in general after 1968. Finally, it highlighted how the mainstream news media created a sensational spectacle of violent unruly protesters, and how they feared the spread of the overseas uprising to these shores. 1. This article is a shortened version of a paper presented at the LHP seminar 1968: A Year of Revolution? 2. ‘The Week Workers and Students Shook up the Ruling Class’, People’s Voice, 3 July 1968, p. 8. 3. Ventosus, ‘Capital Comment,’ New Zealand Monthly Review, 92 (Aug. 1968), p. 6. 4. 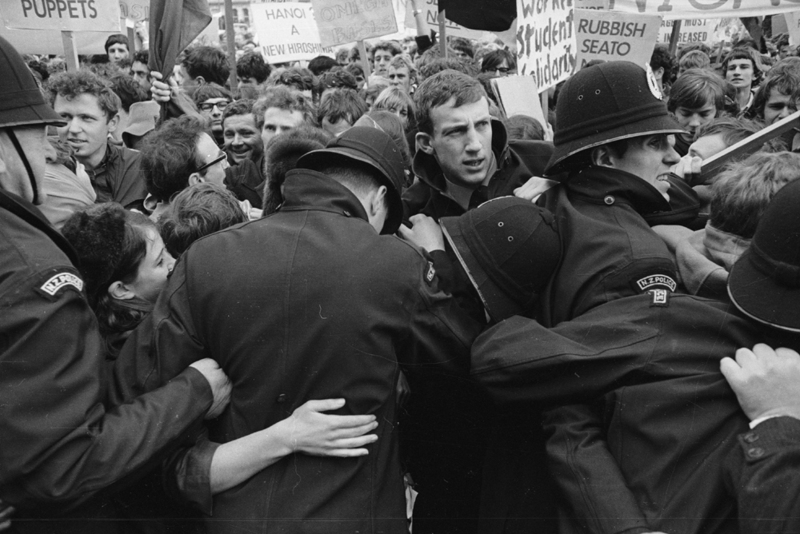 ‘In 1968, Parker was involved in the 1968 march protesting the nil wage award which almost ended in the storming of Parliament’, http://en.wikipedia.org/wiki/Dean_Parker, accessed 27 Nov 2008. 5. ‘Violence Erupts in Protest at Parlt.’, Dominion, 27 June, 1968, p. 1. 6. ‘The Rabble in Our Midst,’ Evening Post, 27 June, 1968, p. 12. Dan Riddiford, National MP for Wellington Central, also said a ‘gang’ of students ‘defied the police and attempted to let loose a tirade of disorder and perhaps death on the people of New Zealand.’ He later said his speech was misreported, claiming he said ‘train of disorder’ rather than ‘tirade’. ‘Riddiford says speech misreported’, Salient, July 23 1968, p. 1. 7. The only substantial reference to the protest I’m aware of is Elsie Locke, Peace People, Christchurch, 1992, p. 219. 8. According to the Evening Post, 3,000 people attended, the Christchurch Star and the New Zealand Herald both estimated more than 4,000, the People’s Voice claimed 6,000, and the Christchurch Press claimed well over 7,000. Evening Post, 27 June 1968, p. 21, Pat Walsh, ‘An ‘Unholy Alliance’: The 1968 Nil Wage Order,’ New Zealand Journal of History, vol. 28, no. 2, 1994, p. 184 n.26, ‘Defiant Mob Blocks Steps of Parliament’, New Zealand Herald, June 27 1968 p. 1, People’s Voice, 3 July 1968, p. 8 and The Press, June 27 1968 p.1. The People’s Voice further claimed the demonstration was composed of 3,000 union members and 1,000 students, while the Press claimed 7,000 unionists marched. People’s Voice, 3 July 1968, p. 8. 9. Ranginui Walker, Ka Whawhai Tonu Matou, rev. ed., Auckland, 2004, p. 207. 10. ‘Violent Demonstrators Force Side-Door State Opening of Parliament,’ Evening Post, 27 June 1968, p. 21 and ‘Burning Resentment for Maori People,’ People’s Voice, 3 July 1968, p. 8. 11. Large demonstrations against the Omega spy-base were held in Christchurch and Auckland in June and July 1968. See Owen Wilkes, Protest, Wellington, 1973. 12. Owen Hughes, ‘June 26 – the beginning of…the end.’ Salient, June 25, 1969, p. 14. 13. NZ Herald, June 27 1968 p. 1. 14. Dominion, 27 June, 1968, p. 1. 15. ‘Road to Victory Open,’ People’s Voice, 3 July 1968, p. 1. 16. Hughes, ‘June 26’, Salient, June 25 1969, p. 14. 17. NZ Herald, June 27 1968 p. 1. 18. Evening Post, 27 June 1968, p. 21. 19. Evening Post, 27 June 1968, p. 21. 20. Dominion, 27 June 1968, p. 1. 21. The Australian High Commissioner’s limousine was ‘scratched, the diplomatic pennant ripped off and the tyres let down’ ‘University Finds Blame Wrongly Put on Students,’ Evening Post, 27 June 1968, p. 14. 22. Hughes, ‘June 26,’ Salient, June 25, 1969, p. 14. 23. See Ventosus, ‘Capital Comment’, NMZR, August 1968, p. 6. 24. Terry Adams, Seamen’s Journal, vol. 3 no. 3 (June/July/August 1968), p. 6. 25. Chris Trotter, No Left Turn, Auckland, 2007, p. 255. 26. ‘Firms urged not to act hastily over wages’, NZ Herald, June 25 1968, p. 1. 27. ‘Thousands March on Parliament,’ Dominion, 27 June 1968, p. 2. 28. Peter Franks, Print and Politics, Wellington, 2001, p. 173. 29. Also Wellington drivers were expected to join the strike – NZ Herald, June 25 1968, p. 1. I hadn't heard of this, so thank you very much for posting!